Disclosure: I received this book for review purposes only. Any opinions are my own. Nothing beats a homemade card or a beautifully wrapped gift that is a gift in itself. 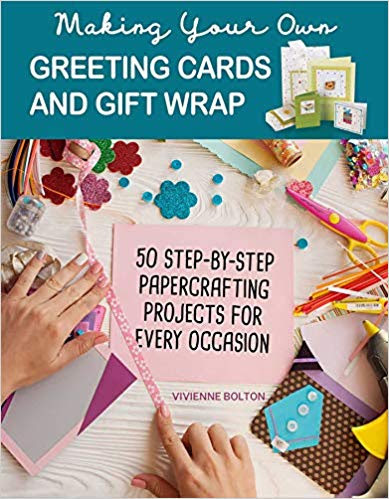 Creative crafter Vivienne Bolton shares gorgeous ideas for both and more in her new book Making Your Own Greeting Cards and Gift Wrap coming out next month in April. Making Your Own Greeting Cards and Gift Wrap shows us how to make impressive cards, boxes, bags, tags, wrapping paper and more with over 50 fun and unique projects that use all of the wonderful materials now available to cardmakers, including stickers, transfers, napkins, wire, foam, rivets and punches. With fun and practical ideas for all occasions you will find beautiful ideas for birthdays, weddings, anniversaries, Christmas, Easter, Halloween, new baby, new home and more. This book provides a great craft idea to enjoy with your daughter or niece and a great way to develop design skills! Enter to win this book below, full of great inspiration for design. Soon you will be saving any and all materials you can get your hands on to use in your own creative creations! A perfect book to get you on your way to making your own gorgeous greeting cards, bags, wrapping and more. Vivienne Bolton is a craftswoman and author of 20 books including The Big Book of Greeting Cards, Handmade Cards & Gift Wrap, and Vintage Projects. Now living in Norwich, England, she regularly lectures and runs workshops at London's famous Geffrye Museum. Find this book on amazon and enter to win a copy below! Enter to win Making Your Own Greeting Cards & Gift Wrap by entering the Rafflecopter form below. USA only please. Ends March 31, 2019. Good luck.